An increase in bearish sentiment is looming as the month of January closed bearish as anticipated in a previous article. All attempts to set the bitcoin price in a bullish trajectory through different fundamental events have not been sufficient enough to sustain the move. Read on as we look at some of the recent and upcoming events in the bitcoin/crypto ecosystem. A bearish price close within last month’s high/low range triggers a double bearish accumulation pattern at February open, signaling the sellers’ presence and huge bearish pressure. 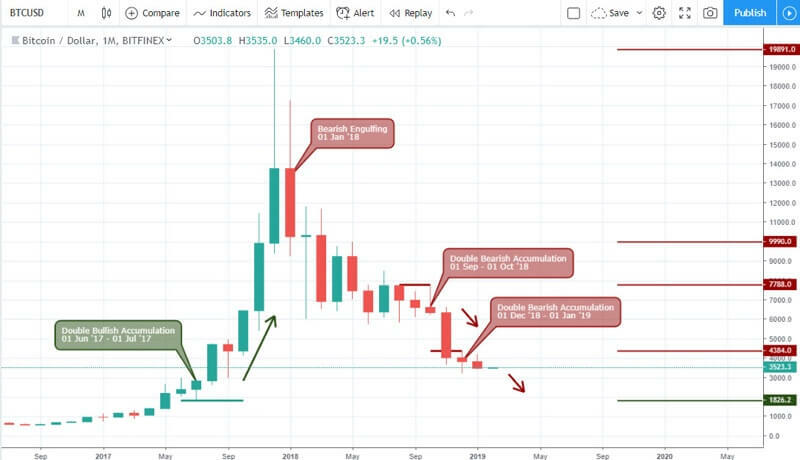 This pattern is very much similar to the bearish accumulation patterns of September and Octobers 2018. 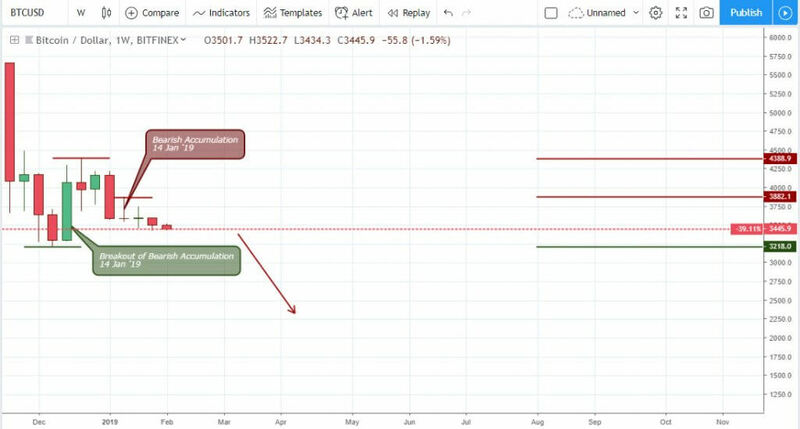 By this, we believe the bitcoin price should continue south towards the double bullish accumulation support of June and July 2017 as a critical short profit target. The daily chart has so far made two attempts to initiate a bullish trend to no avail. First was the breakout of bearish accumulation on January 22 ’19, which later failed to an opposite failure of hidden bullish accumulation on January 27 ’19. The second attempt was on January 30 ’19, with price breaking out of a bearish accumulation. This was rejected by a bearish hidden divergence with an early trigger from a bearish accumulation on February 04 ’19. VanEck’s digital asset strategy director Gabor Gubacs in collaboration with the CBOE and SolidX on 31 January announced a public filling to the United States SEC focused on a change in rule to list a Bitcoin ETF. A listing of Bitcoin ETF as believed by most crypto enthusiasts, investors and speculators is a step in the right direction towards mass adoption of cryptocurrency markets. Next week February 13 is the expiration date for the Bitcoin Future Contract (XBT/G9). Speculators and traders on different bitcoin platforms , like Nadex, will be paying close attention to the price dynamics within this period as they anticipate an increase in volatility. The above 4hour chart started with a failure of bullish accumulation on January 31 ’19 08:00. An opposite breakout of bearish accumulation on February 01 ’19 08:00 countered the bearish decent resulting to price climbing 1.90%. 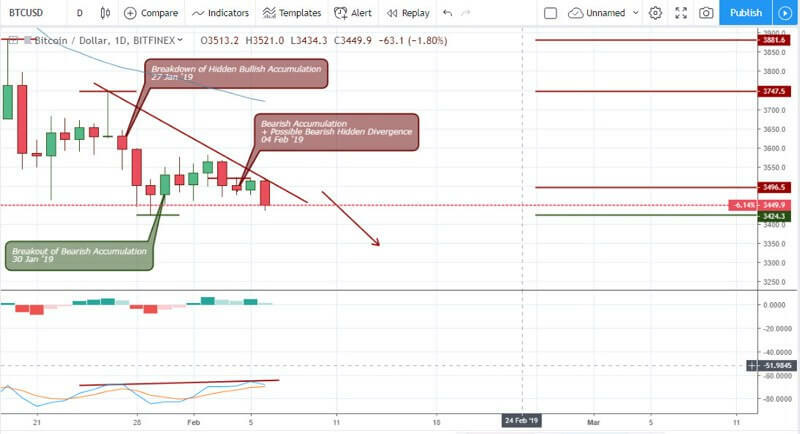 Upon coming in contact with the 65period moving average, the pair experienced a rejection of further ascent and broke below the bullish accumulation on February 03 ’19 08:00. The price breakdown was later supported by a bearish accumulation at the next bar. Finally, a bearish dark cloud cover candle pattern was triggered after price again came in contact with the MA-65. A further price decline is expected for the BTCUSD pair as mass adoption of Bitcoin is still far from sight. Looking at the weekly chart below, a bearish accumulation pattern is anticipated in the event of a bearish price close within last weeks high/low. This in combination with the current monthly chart direction, should guide the pair towards the price projection as mentioned under the monthly technical analysis section.